If you've been hoping to add some sweet and spicy flavors to your fruit salad or any number of recipes, it may come as a surprise that learning how to eat a papaya will satisfy this desire. A papaya's flesh and seeds can be eaten and enjoyed in a number of ways. While the papaya may not be the most exotic fruit on the market, it can be hard to identify. 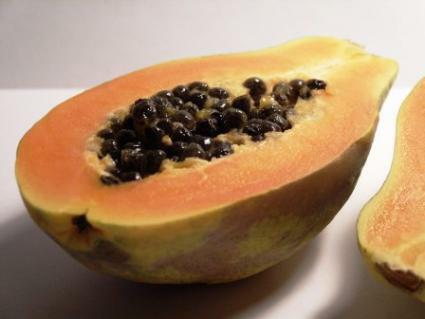 You may have seen fruit in your grocery store labeled as a papaya, and in fact you may have seen what appear to be two completely different fruits with this name. While this can be a bit misleading, there are two origins of this fruit and therefore two types of papayas. The Hawaiian papaya is small, weighing in at just under a pound, pear shaped with a yellow skin. The extremely soft flesh inside is orange or pink with a very sweet taste. The Mexican papaya is much larger, weighing up to ten pounds and averaging 15 inches in length. When broken into, a Mexican papaya will be lighter in color, sometimes yellow as opposed to the very bright orange or pink of the Hawaiian papaya. The flesh is still soft and sweet, but not as intense in flavor as the Hawaiian papaya. The first step in learning how to eat a papaya is to prepare the fruit. The easiest way to separate the flesh from its skin is to stand the papaya on end and slice it in half, lengthwise. Scoop out the multiple, black seeds and set them aside. Don't throw these seeds away; they're edible and can be added to many dishes for a spicy kick. The papaya can now be sliced widthwise into half circle rings. These rings can be served as is and eaten directly from their skin like you would eat a slice of melon. You can also use a paring knife to carefully cut away the skin, just be careful to leave as much of the flesh as possible. At this time the fruit can be diced, puréed or eaten whole. There are many ways to eat a papaya that can add a little sweetness to your food. Try one of the following to add a touch of exotic to an everyday meal. While it's pretty commonplace to simply toss the seeds away of just about every fruit you slice up, the papaya's seeds are edible. Once dried and ground, the seeds have a spicy flavor reminiscent of black pepper. Rinse the seeds well to rid them of the papaya juice. Spread the seeds out in a single layer over a baking sheet and place them in an oven to dry at 200 degrees for ten minutes. The unground seeds can be stored in an air tight container for as long as you'd like, so try grinding them a little at a time and experimenting with their spicy flavor in place of pepper in your recipes. Whether you purchase a Hawaiian or a Mexican papaya, make sure you get a papaya at the height of its sweetness. Look for fruit that is firm, not soft or mushy with a thin, yellow skin. The green skinned fruit can be left on a windowsill, or placed in a paper bag to ripen before using. Avoid any fruit that seems soggy or that yields easily when pressed upon. Depending on the time of year, you may find either variety of the papaya at your local grocers. Try picking up one of these sweet fruits the next time you're browsing the fruit aisle and add some sweet and spicy flavors to your next meal.